If I were a tall skinny girl with blond hair, I'd wear it like this....and have dark black faux lashes. Bunks for a boys room. Do you see it? The rotating baggage claim?! Maybe if you owned a studio apt? Need more of these in my life. Now WHO thought up this and WHY wasn't it me?! Now THIS is a project I'd love to sink my teeth into. What a treat for my eyes. Don't know about these. Makes me want to give away my lunch. Where's my live in carpenter when I need him? If you've read my profile you know that in addition to sewing I am a HUGE sci-fi geek. And I know it may seem like a weird mix but I sometimes write about a show or two that I watch here on TumTum Tree in hopes that someone else out there shares my excitement about these shows. Because for some reason in real life there aren't that many people who like sci-fi....or at least in my life. So, Lost ended last year. It was bittersweet. I loved the show and wanted a big finale but now there was this huge hole in my short list of shows I look forward to watching. They come, they go....they go on hiatus for like....ever....sometimes over a year. With all that coming and going, there's usually about one show every week that I look forward to. Recently, it's been Fringe. But it's always nice to have two. So when a new show that I actually like begins I'm actually quite excited. And I've just found one. Now oddly, I've not entirely been into the Twilight series. I don't know why. I'll watch it and enjoy it but nothing has really pulled me in. Maybe it's something about the actors that missing for me, maybe it's the directing. Maybe it's because the characters are on the really young side? I can't quite put a finger on it. But on the surface it definitely would seem like something I'd like. I've been into BTVS when I was in college and when it's on I'm definitely watching True Blood. So the whole vampire saga/drama is something I can get into. Okay, so I've found a new really good vampire saga/drama I think I can really get into. 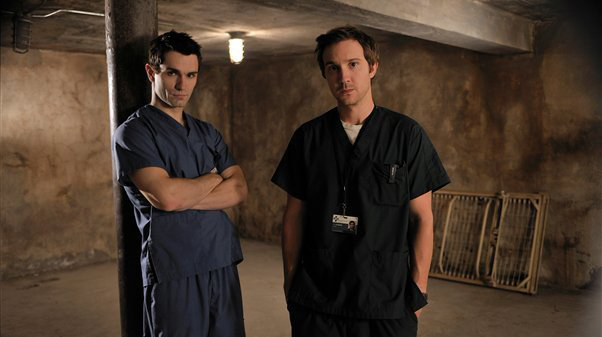 Syfy has a new original series (based on a UK series) called Being Human. I watched it on a whim last night and not since Battlestar Galactica have I been into a SyFy original series as much as I am this one. I am in love with it. Mostly, the characters are what drew me in, but I also like the way the director plays with soundtracks at certain key cliff hanger moments. It's good. I definitely recommend it to those out there who share my love of sci-fi. And if you liked Lost there's a familiar face you might not have noticed if you saw the premiere. Even I had to go on IMDB and double check to make sure my mind wasn't playing tricks on me. He's clean shaven and sporting a different do but it's definitely Jacob (Mark Pellegrino). He plays a central villainous character in this show and it's weird seeing him as a bad guy. I keep associating his emotional cues with his Lost character which I think might be a good thing. In my mind, it gives his character more depth which he doesn't have much of yet (only two shows in). Anyway, I love the show and wanted to get the word out there to anyone else who might like it too. If you have Comcast Cable or Verizon FIOS TV you can watch it on demand 24/7. But if you don't have on demand it's on the SyFy channel Mondays at 9pm/8central. Great for a small place that needs more shelving. Those look like FULL sized beds. Pretty amazing. Is this a product of photoshop or a real thing? Love everything about this room. The colors. The oversized wall photos. The furniture. The beadboard. The easily seen crawl space. Wish this were my beach house. The lighting, the colors, the SETUP! 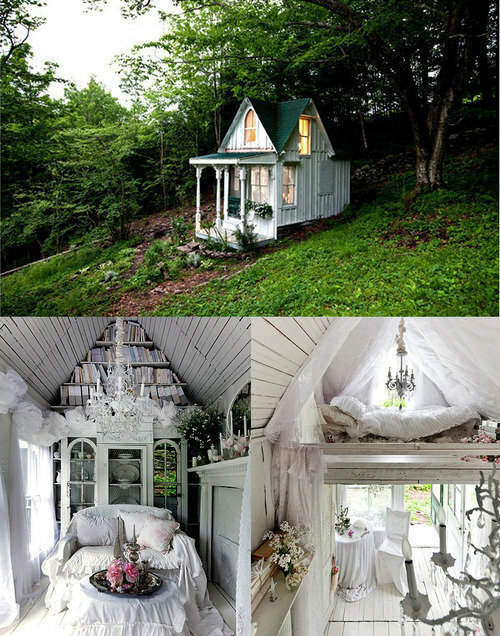 This is so whimsical! I LOVE vintage Fisher Price toys. The new "throwback" versions don't hold a candle. They lack a lot of the gadgets and gizmos which made the originals so appealing. I'm always looking for these at thrift stores and despite the fact that I go every week I never find any. How strange! They were so prolific in their day you'd think they'd be lying on the side of the road. I actually did see one on the side of the road once and considered pulling over and putting it in my car. But I just kept driving. On your birthday you walked. You ate a chocolate cupcake. You wore a yellow duckie dress. You played with your older sisters. You fussed when we put you to bed. Happy Birthday my little bunny. I think I could find an old armoire at the thrift store for cheap and paint it white. But I wonder if it would be hard to get a glass company to cut a piece of mirror in a specific shape on top? Maybe could just get a rectangle one? Anyway, I'd like to try this in my room. I bet you could replicate this for a little girl's room. I'm guessing this is made with felted wool. But it looks just like real river rocks. I'd love to have one of these on a dark wood floor. Or even a bathroom mat? That would be a doable project. A fabulous way to find space for a 1/2 bath in a small home or apartment. Built-in Wall Extension Cord. Why aren't these standard?! I would like to build this house on the cheap and use as our weekend home by the lake. Adjustable Measuring Cup! No more tearing apart your kitchen drawers searching for the right size. Lovely attic double bedroom for a pair of girls. Okay, so how darn cute? Via DesignSponge. This would be totally cute in a kids room. Love the colors, love the wood. Love everything. Although I think I might be afraid to sleep at the top without a railing. Add 2 tablespoons of unsanded tile grout. Now if only someone would show me how to make custom spray paint. I wonder if this could be easily replicated. This is too cute! Buy it here. If I ever had another girl in four years they'd all have one room and bunk beds like this! I've always hated wire cords. This is a very clever alternative!